WARMA through it's catchment officers monitors the water levels in Zambia and collects Hydrological Information. This can help the authority to fulfil its mandate and manage Zambia's waters. Some of the results affecting importand rivers in the country are shown below. This station is located about 70km upstream of Itezhi tezhi dam. The volume of Water measured at Hook Bridge can be considered to be inflows going into the dam since there is no major tributary between the gauge station and the dam. This station is located about 80 Km from Mpongwe district on the Copperbelt. It captures what is coming from Kitwe District, Luanshya District and the contribution of Lumfwanyama sub-catchment on the Copperbelt Province. This station is located about 3 Km downstream Chongwe weir in Chongwe District Lusaka Province. WARMA through its catchment officers monitors the water levels of annual flooding in the Barotse Flood Plain at Matongo, near Mongu. 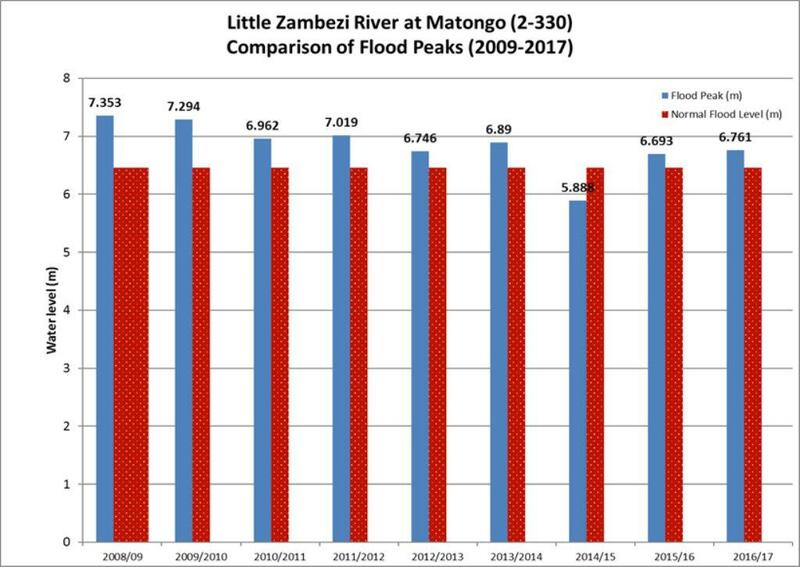 Since flooding is a yearly phenomenon in the Barotse Plains, it is necessary to distinguish normal flooding from extreme flooding events. Hydrological data from as far back as 1956, was used in the analysis. This year’s graph shows that water has been rising steadily. This season’s peak exceeds the long-term normal by 0.306m (30.6cm). 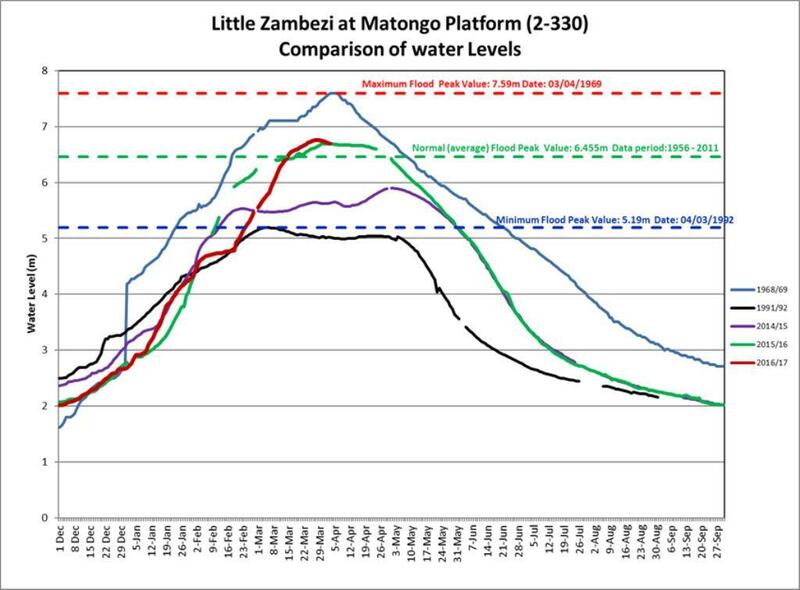 The graph on the left shows water levels for little Zambezi River at Matongo (2-330). The 2015/16 flood exceeded the long-term normal by 0.238m (23.8cm). The hydrological year 2014/15 was much drier. The highest water level recorded during the year was below the long-term normal by 0.559m (55.9cm). From 1956 to date, the 1968/69 flood remains the highest on record. It has never been equalled or exceeded. The 1991/92 hydrological year remains the driest on record.